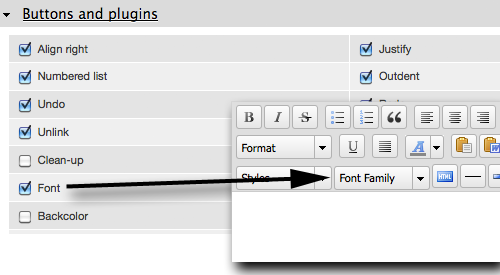 Font selection is enabled in the Wysiwyg profile. Edit the profile (Administration > Content authoring > Wysiwyg profiles > Edit) and enable the Font Family dropdown selector by checking the Fonts checkbox in the Button and plugins section. This is as far as the user interface takes us. For the following example the client has declared, "Friends don't let friend's use comic sans, remove it from the list! And please add this font I found on Font Squirrel named Architects Daughter". In a module for site customizations the hook_wysiwyg_editor_settings_alter() function is defined. This hook fires for all editors so logic is added to specify TinyMCE. The editor fonts are defined in an array to make the list easy to update. In the sample code a line for the Architects Daughter font is added and the line for Comic Sans is commented out. The font list is then assigned to the theme_advanced_fonts variable in the $settings array. The CSS file containing the @font-face definition for Architects Daughter is appended to the content_css variable. This only defineds the font in the editor. The font will also need to be defined for the entire site in the theme CSS. The Wysiwyg profile has a number of CSS options. This code was tested using with Editor CSS set to Use theme CSS. It may be possible to override the content_css value with different settings. For demonstration purposed I've created an example module named WYSIWYG Fonts and made it available on Github at https://github.com/dale42/wysiwyg_fonts. It is completely self-contained. I recommend copying the code to a site customization or helper module rather than using it as-is.